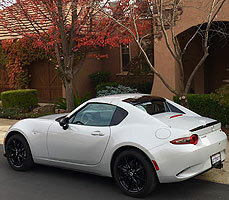 Roseville, CA- Even though changes have been made to the latest edition of the Mazda MX-5 Miata, its essence remains. This is a sports car that puts a high priority on fun. The Mazda Miata has been delivering fun as one of the standard bearers in the convertible category for three decades. The lightweight roadster debuted in 1989 and is the top-selling two-passenger convertible of all time. The popularity continues. In 2017, Mazda reported 11,294 sales for the Miata, its most since 2007. Sales for 2018 is 8,013 with two months remaining. So, clearly the loveable Miata continues to be appealing to U.S. car buyers. Other than the Fiat 124 convertible, the Miata really has no competition in its class. And the latest edition of the Miata could be more popular than ever. The primary change from last year’s model is the 2019 Mazda Miata arrives with a little peppier engine. Other additions include a standard rearview camera, telescopic steering wheel, and a new package for Grand Touring models. While certainly not the most practical purchase because it’s tiny, has virtually no trunk space, and can get rather noisy at high speeds, the Miata continues to be an appealing sports car. Miata is derived from an old German word – miete – which means reward. And that’s why the Miata has remained popular; people enjoy driving the convertible sports car, presumably rewarding themselves. No doubt, it can be considered a rather selfish approach to buying an automobile. Yet it remains a guideline for folks who like the top down, wind blowing slightly in their face, and taking drives for pure enjoyment. Reminiscent of the British roadsters of the 1950s and 1960s, the lightweight Miata is a rear-wheel drive convertible that delivers precise handling and is a joy to drive on challenging, twisty roads. The driver has a tremendous feel in a Miata because the steering is immediate and very accurate. If you don’t know how to drive a stick, it’s worth learning because shifting gears in a Miata will bring increased enjoyment. The six-speed manual is an easy clutch to master, while the optional six-speed automatic has steering wheel paddle shifting. Available in three trim models (Sport, Club, Grand Touring), the Miata gets quicker for 2019, thanks to a more powerful 2.0-liter, four-cylinder engine that produces 181 horsepower (an additional 26 hp) and 151 pound-feet of torque. It travels 0-60 mph in around 5.8 seconds, a dip of nearly a half second from last year’s model. The Miata cabin layout remains pretty basic and is devoid of practically any storage space. There’s not even a glove compartment and the trunk is miniscule (4.6-cubic-foot). But this two-seater offers solid leg and head room for average-size drivers and their companion. The standard Miata has USB connectivity and Bluetooth phone and audio, plus a 7-inch touchscreen that doesn’t require a session in the driver’s manual to master. The interior no longer has an abundance of hard plastic material. Purchasing a 2019 Mazda MX-5 Miata is probably not going to lead to any regrets. If driving a relatively inexpensive convertible for fun is the desired goal, you’ve come to the right place.